Hall of fame golf instructor, Jim McLean, and Master Instructor, Adam Kolloff, reveal a revolutionary new system for using golf's premier technology. Based on ability level, this system will show you what numbers to look for, how to pinpoint swing flaws, and how to make swing changes. If your an instructor, coach, Trackman owner, or simply interested in learning more, this book is for you. Within each level we've matched Trackman feedback with specific teaching concepts tailored to each level. We've built ranges or safety zones to give the golfer a clear picture of what numbers to look for. When the golfer's numbers are not within the safety zones we provide detailed instruction and Trackman drills for improving your numbers. This is truly a manual for learning and improving your golf swing with Trackman. World renown golf instructor, Jim McLean, shares his timeless instruction to help you improve your numbers. You will learn basic fundamentals in body motion and club action, which are based on tremendous research while studying the best players in history. It doesn't matter if you're a beginner, intermediate, or advanced golfer, this book gives you all the tools for improving your golf swing with Trackman. 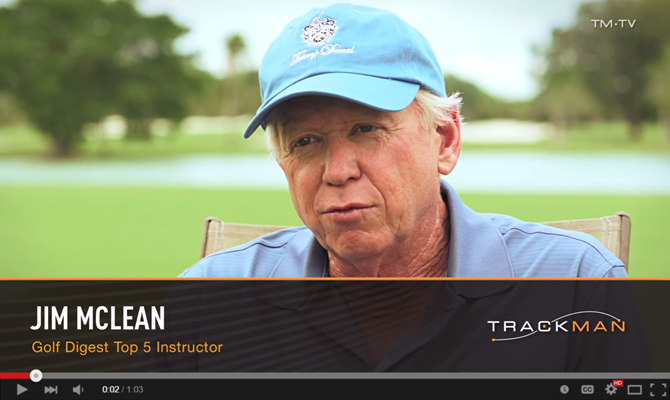 Jim McLean and Adam Kolloff provide instructional videos to help golfers of all ability levels improve with Trackman feedback. Learn about the latest research from Trackman and the Jim McLean Golf School to understand the feedback more effectively. Gain insights for using all the TPS software features to maximize your use of the technology. Jim McLean has been a teacher to golf professionals worldwide and is regarded as one of the very top golf swing researchers in the game. He has been a PGA Master Professional since 1990 and has led more than 50 national teaching workshops for the PGA. Jim has authored 11 top selling golf instruction books, produced over 20 DVDs, and writes full time for Golf Digest magazine. Jim has competed on the PGA TOUR, played in the U.S. Open, the U.S. Senior Open, the U.S. Amateur and the U.S. Junior Amateur, and also competed in the Masters, where he made the cut. He was an All-American at the University of Houston and has won more than 50 Junior and Amateur titles. Adam Kolloff is Owner and Director of Instruction at Pure Drive Golf. After playing on the Gateway Tour from 2007 – 2009, Adam became Jim McLean’s teaching assistant at Trump National Doral, which included working alongside Keegan Bradley during his breakout year in 2011. Adam is ranked as a Golf Digest Best Young Teacher in America and a Best Teacher in the State of New Jersey. He frequently coaches other PGA professionals and leads PGA teaching seminars about teaching with technology. His proficiency with Trackman and ability to work with players of all ability levels has made Adam one of the most sought after teachers around the country. Sign up and learn the Top 10 Mistakes Golfers Make with Trackman, plus receive a free sample of the book! "Top 10 Mistakes Golfers Make with Trackman," is also included when you purchase the book. Thank you, now check your email inbox.